North Central Railway Recruitment notice on their official website. There is a mega recruitment in North Central Railway, its release 446 vacancies for the various posts. The candidate must have passed 10th class examination or 12th passed or ITI. There are various posts like Fitter, Carpenter, Penter, Lohar/Black Smith, Welder (Gas&Elect), Electrician and so on. Last date for submitting documentations for the post is 17th December 2018. 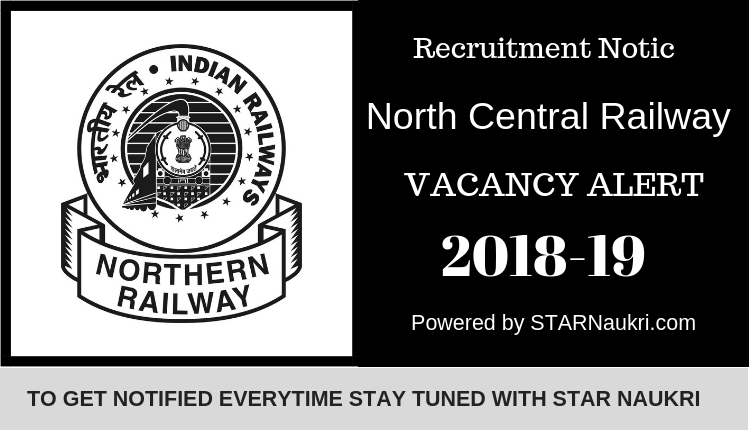 North Central Railway Bharti 2018 North Central Railway Recruitment notice on their official website (www.ncr.indianrailways.gov.in). It is one of the seventeen railway zones in India. It is headquartered at Allahabad and comprises three divisions: reorganized Allahabad division of the erstwhile Northern Railway. The largest railway station in NCR is Kanpur Central. There is a mega recruitment in North Central Railway, its release 446 vacancies for the various posts. The candidate must have passed 10th class examination or 12th passed or ITI. There are various posts like Fitter, Carpenter, Penter, Lohar/Black Smith, Welder (Gas&Elect), Electrician and so on. Eligible candidates can apply for this posts. Last date for submitting documentations for the post is 17th December 2018. For more notification of North Central Railway Recruitment 2018 are given below. North Central Railway Recruitment notice on their official website (www.ncr.indianrailways.gov.in). It is one of the seventeen railway zones in India. It is headquartered at Allahabad and comprises three divisions: reorganized Allahabad division of the erstwhile Northern Railway. The largest railway station in NCR is Kanpur Central. There is a mega recruitment in North Central Railway, its release 446 vacancies for the various posts. The candidate must have passed 10th class examination or 12th passed or ITI. There are various posts like Fitter, Carpenter, Penter, Lohar/Black Smith, Welder (Gas&Elect), Electrician and so on. Eligible candidates can apply for this posts. Last date for submitting documentations for the post is 17th December 2018. For more notification of North Central Railway Recruitment 2018 are given below. उत्तर मध्य रेल्वे भर्ती नोटीस त्यांच्या अधिकृत वेबसाइटवर. हे भारतातील सतरा रेल्वे क्षेत्रांपैकी एक आहे. त्याची मुख्यालय अलाहाबाद येथे आहे आणि त्यात तीन विभाग आहेत: पूर्वीचे उत्तर रेल्वेचे पुनर्गठित इलाहाबाद विभाग. एनसीआर मधील सर्वात मोठे रेल्वे स्थानक कानपूर सेंट्रल आहे. उत्तर मध्य रेल्वेमध्ये मेगा भरती आहे, त्याद्वारे विविध पदांसाठी 446 रिक्त पदांची सुटका झाली. उमेदवाराने 10 वी उत्तीर्ण किंवा आयटीआय उत्तीर्ण केलेली असणे आवश्यक आहे. फिटर, कारपेन्टर, पेंटर, लोहार / ब्लॅक स्मिथ, वेल्डर (गॅस व इलेक्ट), इलेक्ट्रीशियन इत्यादी अनेक पोस्ट्स आहेत. पात्र उमेदवार या पोस्टसाठी अर्ज करू शकतात. 17 डिसेंबर 2018 रोजी पोस्टसाठी कागदपत्रे सादर करण्याची शेवटची तारीख आहे. उत्तर मध्य रेल्वे भर्ती 2018 च्या अधिक अधिसूचना खाली दिल्या आहेत.